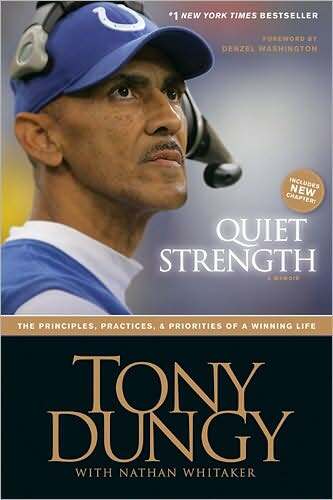 First up, Quiet Strength by Tony Dungy and Nathan Whitaker. Tony Dungy proves it’s possible to be wildly successful while still maintaining the priorities of faith, family, and integrity in the competitive, ego-driven world of professional sports. He demon- strates that a person can possess the drive and de- sire to win it all, yet do so with a servant’s heart. Tony is a role model for many throughout the NFL, for families, and for those touched by his ministry work. As we learn how Tony came to be such a role model, we’ll discover how we, too, can practically use our faith to influence those around us. page 19: “To whom much is given, much is required – whether it’s privileges, responsibilities, or material items. And if God has given you a lot of ability, I believe you should be held to a higher level of expectation. I learned a lot about having faith from this book. Tony speaks about his faith in ways that are so real and life-applicable. I highly recommend this read!